So this may be a crazy idea but at the time I thought it was pretty special. I was working on a project and had to minify some CSS code. I quickly became exhaust of the whole process. Edit CSS, minify the code, republish to site. Make more changes to the CSS code, minify the code again , republish the code again. Depending on how often you make these types of changes this process can get a bit tiresome. So I thought, Oh crap why not make a API ! The idea was to basically allow developers to work on their code and at anytime save the changes. The API will dynamically return the compress version. Boom! 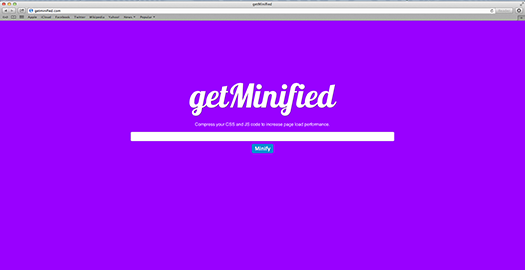 and thats how GetMinified.com was created. I bought the domain for less then $5 from Godaddy using a coupon code. Then the next following day I crushed out the code. Right now I’m fine tuning the backend but it seems to work as is. I’m gonna create a API sign up page to collect emails so I’ll be able to notify users if the API updates.